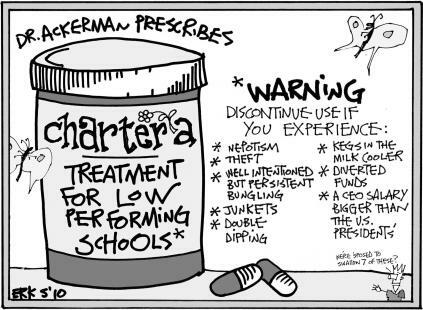 Charter schools are too often barnacles on the underbelly of the ship of our educational system. Charter schools are too often costly failures, at public expense, as was the former St. Paul School of Excellence, which closed after convincing City Commission to provide it with historic Echo House, which it did not restore as promised, then demanded to destroy it, with hostile hateful heckling of people who wanted to preserve it -- an embarrassment to St. Paul A.M.E. Church and its members. Historic Echo House (2/3 of it) is gone now, victim of worshipful craven Commissioners deferential to false claims by Rev. Ron Rawls and the St. Paul School of Excellence. First Coast Technical College, the latest failing Charter School, needs to have its charter revoked. The apparent financial cave-in at First Coast Technical Center should be of real concern to residents. The gap it fills in both education and job readiness here is immense — well beyond the number of graduates it grinds out. We’ve all heard that a college education isn’t for everyone. But for many who don’t understand the nature and scope of vocational training, it is still looked upon as something you do if you can’t cut it in college. Nothing could be further from the truth. The job market for liberal arts college grads is a tough one. But degrees earned at FCTC can be made to mesh with a changing job market. With the growth in our county, there’s a ready-made market for automotive and welding techs, nurses, firefighters, paramedics and cosmetologists — all courses offered at FCTC — and more. We’re told that a welding tech’s paycheck is in line with a first-year school teacher. Depending upon the trade school student’s work ethic and skill, his potential for increasing income levels is much less limited. And then there’s overtime — certainly something district teachers put in plenty of, but for free. FCTC is an anomaly in Florida. It’s a charter school, predominately postsecondary. But here, high schoolers take electives as well — most aiming at the trades rather than college courses. It’s also a hybrid conversion charter school, one of two in the state, in which the teachers are paid by the local school district — and later remitted by FCTC. The charter is also housed in a district-owned facility. The future of the school is unclear. But it could be much worse right now if not for the oversight of the local school board and administration. In granting the charter back in 1999, the board demanded monthly, rather than allowable quarterly reviews of financials. That’s how we were able to so quickly catch the money meltdown. The school was on the brink of financial collapse when the administration jumped in. Subsequent investigations by the school district’s financial team are uncovering a more complete picture of where and how the school is hemorrhaging apparently dwindling revenue. The school district will have two options as it appears today — bail it out or take it over. And that’s really no option at all. 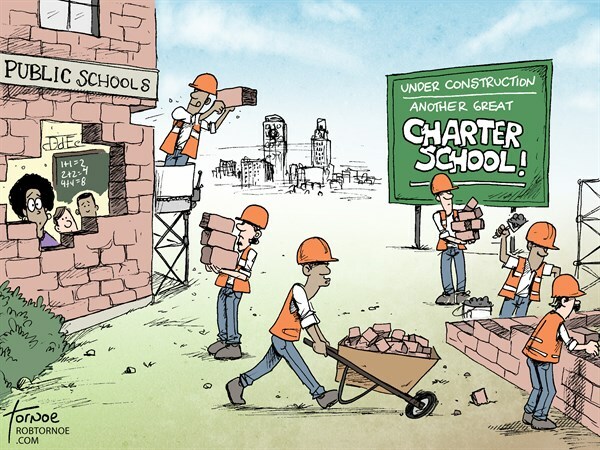 We can guarantee you won’t catch our school board or school superintendent pumping public money into a failing charter school — though some state legislators in leadership positions make a living at it — literally. At this point two things ought to be clear to everyone involved — and you, as taxpayers, are involved. 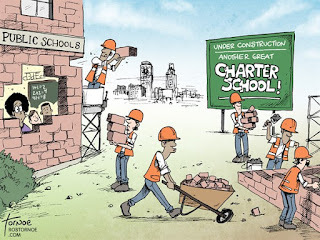 First, this is another sign of the overall failure of charter schools in Florida. Since they began operation in 1996, 269 of 900 schools have failed (by 2015). The Naples Daily News spent six months last year going over the records of state charter schools opened since 2008. Since that time, 119 failed. Of that number 64 shut down because of financial difficulty (insolvency) and 44 because of academic difficulty (receiving back-to-back F grades). These schools are publicly funded, but have far fewer or stringent standards of academic or financial accountability than their public counterparts. Second, our school district must revoke the charter and take over FCTC, including the campuses in both Putnam and Clay counties — 1,700-plus students in all. Because of the unique relationship of the conversion charter structure, it will be both more difficult to accomplish and more important that it succeed. The curriculum is more than learning. It is life-changing to many students. It’s their singular way out of lives with little promise or pride. We guarantee a better school will emerge. And, we believe, our local employers will find more impetus and new avenues in which to partner with the school district to help ensure that the local workforce is trained for their specific needs and that the workforce has jobs ready after graduation.